I already noted that many of the people at the Draft Environmental Impact Statement hearing last Wednesday who wore buttons with a slash through NIMBY (Not in My Backyard) were from neighborhoods far from the proposed Atlantic Yards project site. Some wore both the slash/NIMBY buttons as well as ones that said "Yes In My Backyard." Probably the least convincing wearers of those messages were a group of Williamsburg Hasidim, as pictured in the Courier-Life chain. 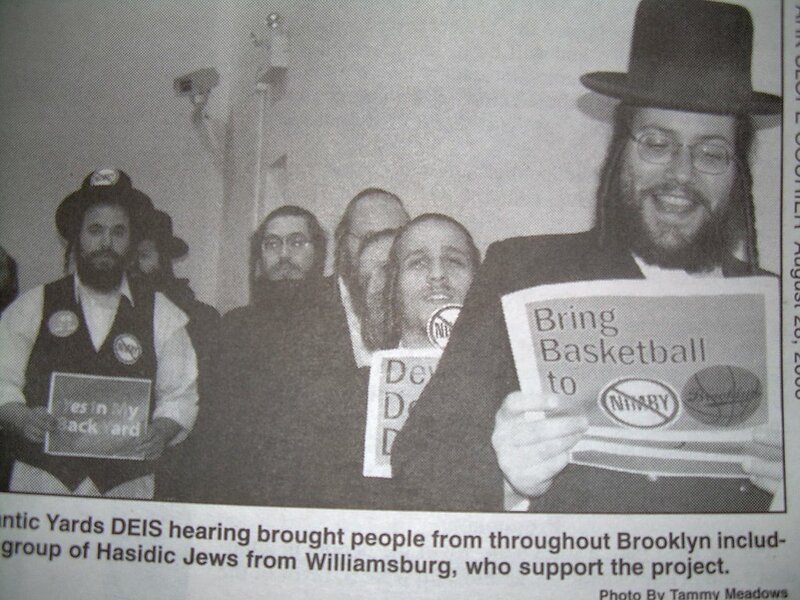 Not only is there no room in South Williamsburg for an arena--the population keeps growing exponentially--but those in this enclave want to keep their distance from people who don't share their ultra-Orthodox beliefs. The visitors were from the community of 57,000 Satmar Hasidic Jews who live in south Williamsburg and who have in recent weeks been alarmed by talk of their neighborhood being invaded by ''artisten,'' a Yiddish word that in local parlance is used to describe non-Hasidim who live on the north side. What was their motivation in supporting the project? To make sure it doesn't occur in their neigborhood? Any idea who mobilized them and why?